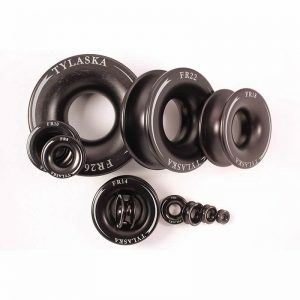 Tylaska Ring Ferrules are lighter and smaller than a conventional pulley block and have become a popular alternative for many applications where traditional blocks once ruled. Instead of rolling on a pulley sheave, the active line with a ferrule merely slides on the inside smooth surface of the ring. Another line is spliced around the ferrule for attaching it. This attachment line is sometimes made as a loop that is luggage tagged onto a padeye or the toe rail. Frictional losses are not as big as one might think, especially when using low friction line such as dyneema. In addition to being lighter and less expensive than conventional blocks, ring ferrules are also less prone to failure since there are no pulleys to crack or bearings to foul.